Even before I’m a very petite girl. Now that I’m already a mom of two, I still have this petite features! Ow? I don’t have regular exercise but I guess, being a mom at home with 2 messy and hyperactive kids is already one way of maintaining my figure. In fact, those clothes I have during high school days still fit now. I found a couple of old blouses. The blue old shirt belongs to a group of clothes where I always wear at home, casual or shall I say a boring shirt already – no style. And that pink halter! It has style but I have only worn it once. It’s good for beach outings but I don’t get to beach often. I can wear it at home as my casual wear but it doesn’t look right – the bust area, the lower part of the blouse – it’s just not comfortable to use. And so I pull them out from the closet down to my DIY table. 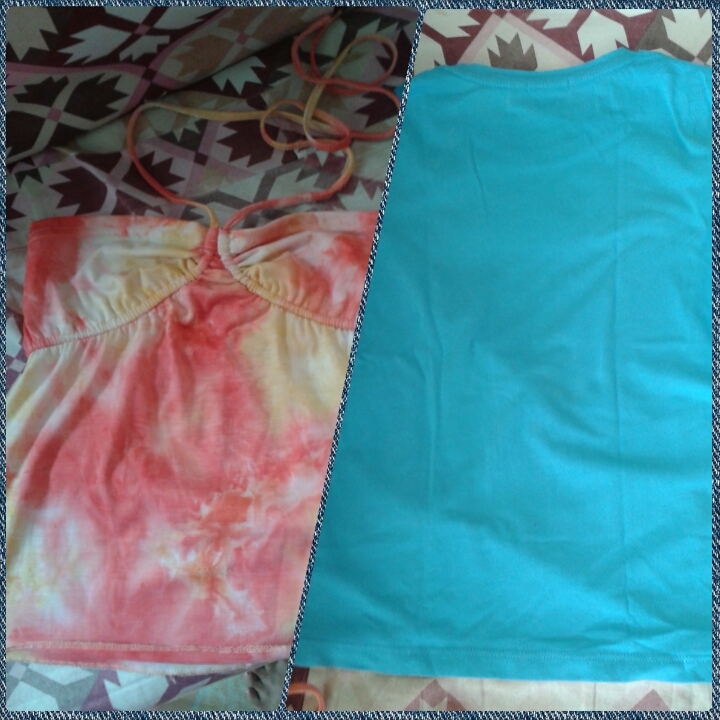 This restyle-an-old-shirt project is repurposing 2 old tops and won't need a sewing machine, so relax! No cost and only a little amount of basic sewing skills is enough. Remove a portion on the back of the blue shirt. Just enough so you won't feel naked when you wear this. Lol! 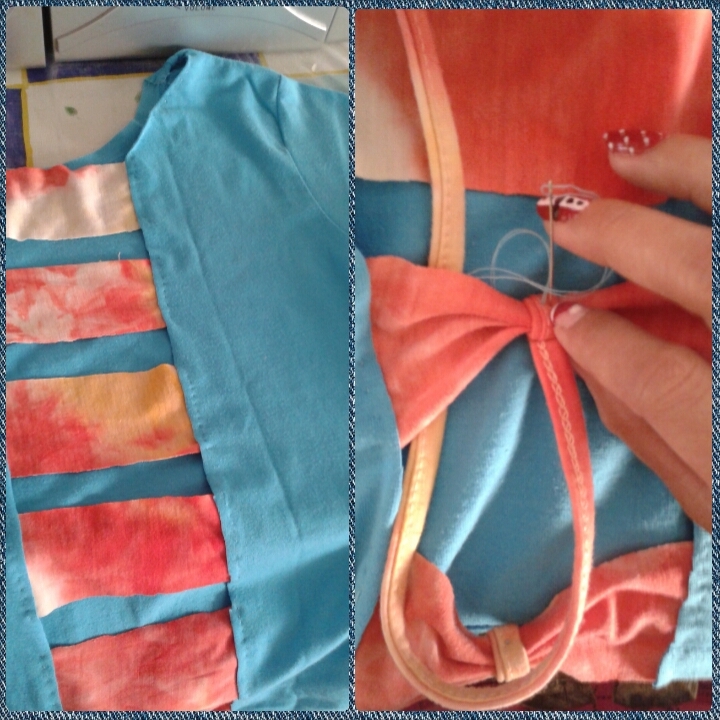 Cut strips of the same size from the pink halter and sew them with 2 cm spacing from one another. Form them into a ribbon. Take the halter strap and wrap it around the ribbon to hold its form. And done! The old shirt has now a new style. 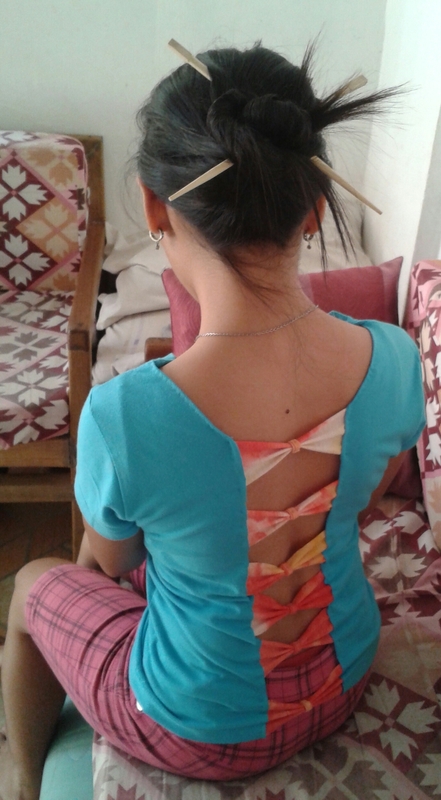 Presenting my new blouse in fashion! It’s a hottie. So proud of my creation and I’m excited to wear it! One day, I will make one like this for my daughter. You can refashion or restyle your old shirt too...make it like this or better than this. Good luck!